Clog dancing was popular in the 19th century in the north of England, particularly Northumberland and Durham. The 'clogs' were shoes with wooden soles rather than the Dutch variety. The style of dancing was similar to Irish step-dancing in that the body remains immobile and the face expressionless while the feet beat out complicated rhythms like a tap dancer. Dan Leno would boast that he could 'put more beats into sixteen bars of music than a drummer can with his drumsticks'. In 1880 he won the competition for Champion Clog Dancer of the World, organised by Joe Wood at the Princess's Music Hall in Leeds. The judges sat under the stage and listened to the beats to decide the winner. The prize was a gold and silver belt. The clog dancing triumph was the first taste of success for the twenty-year-old Dan who had been scraping a living with the family music hall act all his life. Geo. Mullon won the title in 1881, followed by Benjamin Ray in 1882 when Leno was on the judging committee. He entered the competition again in 1883 and lost, but so many people were dissatisfied with the decision that the new champion agreed to a re-match at the People's Music Hall, Oldham. However, he managed to lose the belt before the competition took place. Leno emerged victorious from the six-night contest and was presented with this new belt, made in Sheffield to mark the occasion. He was never seriously challenged again. 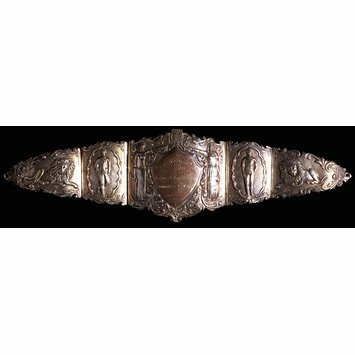 Silver prize belt made in 5 convex sections hinged together, each section raised and chased with figures and decorative foliate scrollwork. The central silver gilt section features a shield topped with a lyre, the shield engraved: 'CHAMPION BELT WON BY DAN LENO Champion Clog Dancer of the Worlds AT THE People's Music Hall Oldham AFTER 6 NIGHTS CONTEST May 14th to 19th 1883' The shield is flanked by a standing Classical muse each side. The sections to the right and left of the central section feature images of full-length clog dancers, and hinged to them are sections each featuring a recumbent lion. Both ends have a hole for attaching a chain or other fastening. Hallmarked on several sections with a full hallmark on the central section comprising the maker’s mark, the lion passant, trhe date mark P, the crown, and Victoria’s head. The reverse has rivets, some with nuts, some without, indicating that this silver belt was probably originally attached to a leather backing. Prize belt awarded to the music hall performer Dan Leno, or George Galvin (1860-1901) for clog dancing, 19 May 1883. Chased and engraved silver made by Rhodes & Barber, Sheffield, 1882.